The field proven Uninterruptible Voltage Source, UVS-L, is more than a voltage regulator or line conditioner. Its unique and unmatched features will significantly improve your equipment’s reliability, virtually eliminate power-related downtime and dramatically increase productivity. 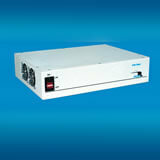 Its revolutionary small size and weight make it ideal for OEM and integrated applications. A Bell Labs study indicates that over 95% of power problems consist of everyday disturbances that wear and tear hardware, software and profitslike spikes, sags, noise, brownouts and voltage/frequency deviations. Constant voltage transformers, line conditioners and other devices are not designed to rectify all of these problems. In contrast, since UVS-L is a solid-state generator, it prevents these daily power disturbances from reaching your equipment. It continually regenerates new, clean AC power in pure sinewave form for superior protection. Even with wide input variations in voltage and frequency, UVS-L’s output steadfastly remains at its designated voltage and frequency It also allows your system to continuously operate during extended brownouts to 88 VAC. Due to the UVS-L incorporating Falcon Electric’s patented on-line UPS engine, the output voltage and frequency are totally regenerated eliminating wide voltage and frequency variations (voltage variation specification is +/-2% and frequency variation is better than 1%). The output frequency can also be set independent from the input, making the UVS-L an ideal frequency converter. The UVS-L will also accept a very wide input frequency range from 45-450Hz, while providing a fixed 50 or 60Hz. UVS-L provides a substantial ride-through capability of several cycles during brief power interruptions. This approach to ride-through makes UVS-L ideally suited for high-temperature environments and significantly increases your systems’ MTBF.